Some of my blogging friends have been doing things like Worktable Wednesdays or finding other thematic days to highlight their studios. I thought I’d join in. Muddled Monday came to mind, but it’s not Monday. Disarray Daily is more all-purpose. Although Freaked Out Friday might’ve worked as well. I need to get stuff done. I have a show headed toward me. Thanks to my various maladies, I feel muddled and very, very tired. Pretty much all the time. I have been doing things, but not finishing much of anything. I have quite a few half-made prototypes and projects. I keep telling myself this is good — better than no projects at all! Still. I decided that I need to pick one thing and focus on it as best as I can. Just start working through the list. 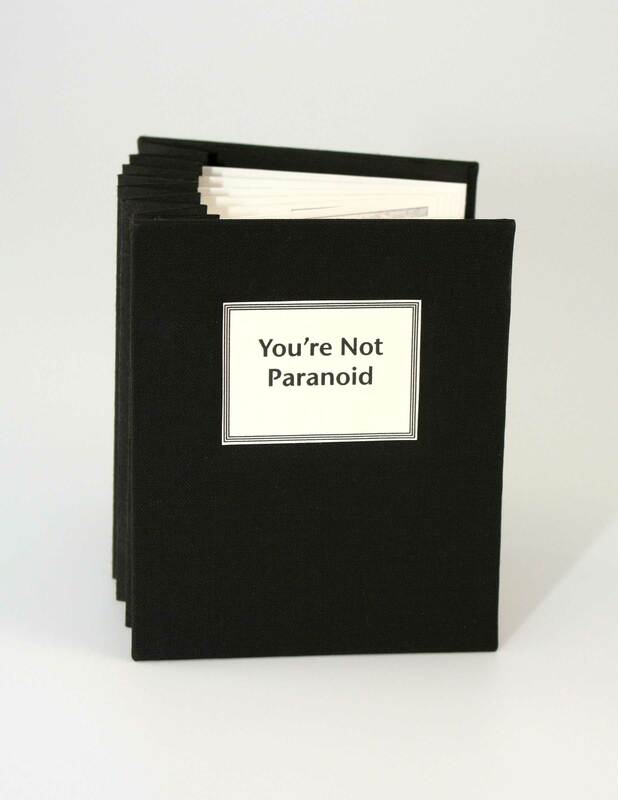 First up is a flag book called You’re Not Paranoid. I made one similar to it a couple of years ago, and decided to make a more polished small edition. This is my prototype copy. I took Karen Hanmer’s advice and used a heavier weight paper for the flags than the spine. 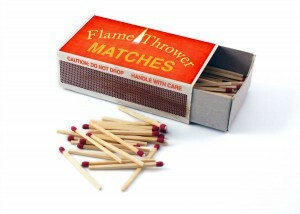 This ensures a satisfying tactile experience when opened. A few other things in the pipeline: a small edition foldout book about germs with petri dish covers; a Board Book for Bored Children that will require a disclaimer that, no, I’m not really suggesting children play with matches or bleach etc; a book about memory made with a dollhouse window in a box (still being assembled); and an accordion consisting of layers of transparencies. Still not started, but being contemplated, is something with a skeletons in the closet theme. And I haven’t forgotten the vending machine minis, although I haven’t been able to do much with them at the moment. I feel overwhelmed. 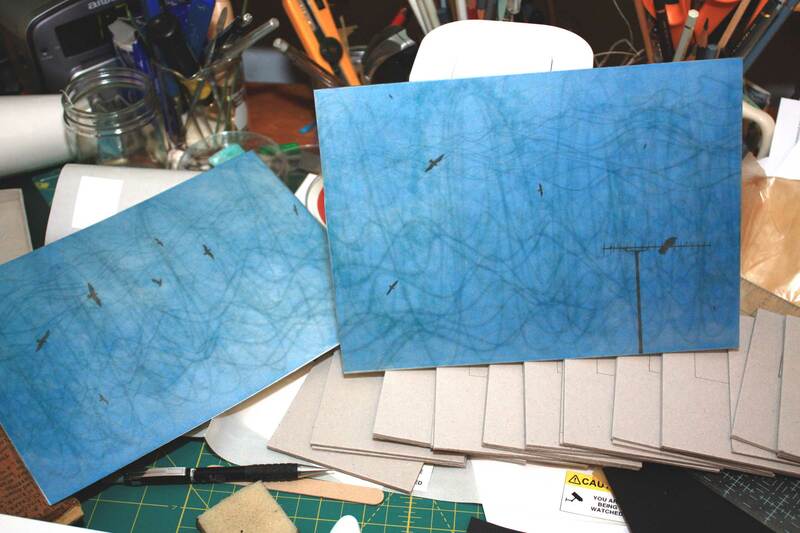 The pages will actually all be connected, accordion-like and attached to the petri dish. Transparencies layered with dry mount adhesive. This is becoming more complicated than anticipated. Really kids, don’t try this at home. Most of these projects keep winding up piled on my table. Often all at the same time. Reminds me . . . years ago a friend came to visit. He was a sculptor whose work emphasized open space and clean lines. After sitting down in my studio, he began to look noticeably uncomfortable. Beads of sweat formed on his brow. He needed to go outside. My workspace gave him a panic attack. Love the flag book. Too true. And the petri book as well. Thanks. Truth be told, you are right–I get panic attacks from my living and working spaces too. But it was pretty funny. The studio actually wasn’t that untidy then–I think it was the sensory overload and the clutter. It’s the collagist in me. I love your daily titles! I think there will be more blog posts in the future with themed days that you have named! They sum it all up so well. Thanks. I have been looking (and looking) for how to add a subscribe to comment follow-up box, but am still coming up blank. I don’t know if it’s something special I need to activate with WordPress or something lacking in the theme I picked. I will work on this some more. @#$%! irritating WordPress. I do very much appreciate this being brought to my attention. It’s something that does need to be fixed. 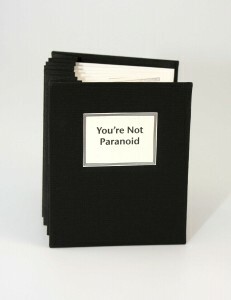 I like the “you are not being paranoid”, very impressive with all the eyes. Makes me feel queezy just seeing it in the picture. And it was nice to see the petri dishes again :-) I take it these are the petri dishes you experimented with making them look like they have something growing inside? Sorry to hear you are so unwell. I hope you’ll get better to finish all those projects. I am especially intrigued by the idea of the children’s book, and hope we’ll get to see more of it in time. I hope things are going ok with you!! Keep on truckin’ Ellen! I think your ideas are fabulous and I look to you for my own inspiration! It’s wonderful how you share your process and for that I thank you. I do find many artists I am surrounded by are, shall we say, ‘cagey’ about process and their methods of working. 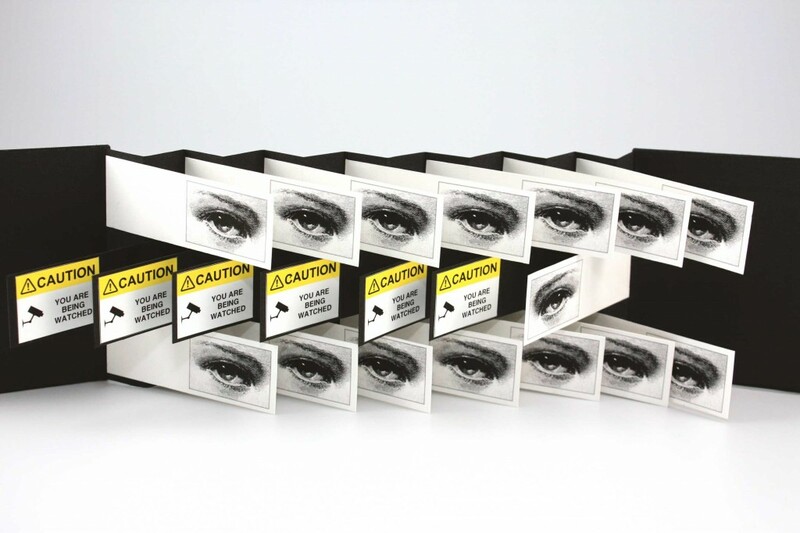 I particularly look forward to your transparency layered book. Sounds interesting. Something I have thought about too having discovered acetate that will print very nicely through the inkjet printer. So maybe we can compare at some point. Lastly, ideas are trying! I can only liken them to demanding children – they never rest and keep you up all night! Tan! What a pleasant surprise to see you here. Speaking of never resting and being kept up all night, I don’t trust myself to be lucid enough to properly respond! Been gluing covers to make up for the previous ruined covers, and it’s now time to fight with Dominic over possession of my sleeping space. . . however, I do want to say how much I appreciate your supportive enthusiasm. It means a lot! I too love printable acetate! I’d love to see what you do with yours! 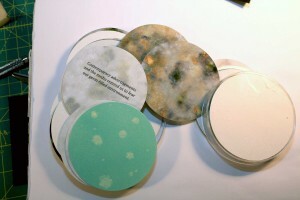 I am looking forward to seeing how the petri dish covers work out. Thanks Elissa! I’m happy to report that an edition of 15 petri dish books is nearing completion. To be posted soon! I am slowly going through your blog and love your tutorials!! I’ve printed a bunch of lovely things that I now need to DO something with! Anyway, just wanted to say how *much* I enjoy your writing and your really interesting and fun projects!! I can relate to the half-finished business for sure. Just because I’ve printed a bunch of lovely things doesn’t mean I’ll actually DO anything with them for ages. But, yes, please post more!! And when I get something done, I will let you know. I figure that things sit around and simmer in the imagination until they’re ready to made into something. And, yes, please do let me know when you get something done! Thanks again. Well. I made something. I did not follow a tutorial. I had something charming in my house that I used as inspiration. Alas, what I made and what I was using as inspiration couldn’t be further apart in terms of quality. Sigh. I’ll try again, this time maybe using, I don’t know, instructions?! I’d post a picture but it’s really too embarrassing. Wandering Book Artists in Arcata And the cat will climb down by the tips of his claws.